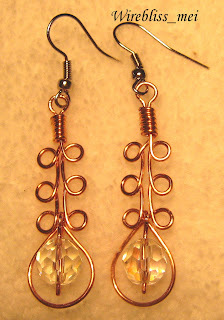 It was not as easy as i thought to work with copper wire. Few times i pressed my plier too hard that i almost brake the wire. Maybe i worked too much with stainless steel wire that i forgot copper is softer than stainless steel....LOL. Mei - you did a beautiful job - it is hard to believe that it was your first try with copper! It is a warm lovely color and your chose the perfect stone! Yes, first time with real copper. the one i used for the bracelet was coated with something (recycled copper fm car parts) so its harder.